I hate to say it but I will. RG3 went down, and the future of the franchise lay on the ground to the disappointment of the silent stadium full of Redskins fans. Although the injury is not career threatening at this point, it’s arguable if RG3 will actually be able to play at the level he was before the injury. Not RG3′s. The problem is the person involved is not thinking clearly or wisely at the moment. They are focused on themselves, considering only the moment and the short term, not the long term. They do not understand the long-term ramifications of their actions. Even though RG3 said he could still play the responsibility to make the right decision ultimately falls on the coach, the leader of the team. He should be realistic enough to make the right decision. This year, The Washington Redskins – once favorites to win their division and challenge for the Super Bowl – are 3-10. They will not even be making the playoffs and their coach is under intense scrutiny. Their quarterback RG3 has looked awful this year and it seems he still isn’t fully health, hasn’t regained his speed and quickness from before the ACL injury. CBS reports Coach Shanahan is contemplating shutting RG3 down for the rest of the year so he can get healthy and concentrate on next year. Though Griffin hasn’t been nearly as good in his second season as he was when he was a rookie, Shanahan said this isn’t an instance where he’s benching his quarterback because of performance issues. Instead, he’d do it to keep Griffin healthy going into the offseason. Hmm, maybe something he should thought of last year before he chose to risk his future investment. The point here is to not make fun of a struggling team (ha, the Seahawks are league leading 11-2) nor pick on an injured player. It’s to review a huge leadership lesson from a year ago and look at it from the framework of what has transpired. As I predicted last year, keeping Griffin in the game risked not only that season but they ended up losing the next one (that being this season). It was a risk and they took it. The thing is, as a leader our decisions have major consequences. Sometimes the most drastic affect the immediate, such as the choice of throwing the ball to the wrong team as to cause an interception. But sometimes – and often most times – our decisions have consequences we cannot see or aren’t even aware of yet. They are long term consequences. That last statement is the hardest part of Leadership. Being a Leader is all about taking risks – albeit calculated and well thought out risks. During a time of decision, you must be able to inuit enough about the future to understand the long term consequences of the choices right in front of you. And unfortunately, maximizing for the immediate usually comes with a huge price tag in the future. In this case, it might even be a shortened career of one of the most gifted quarterbacks to come out of college. 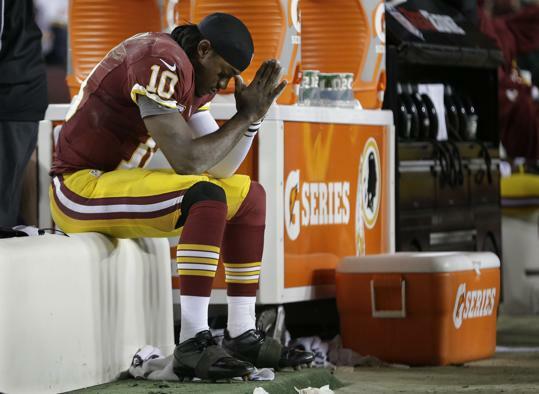 It’s tough to watch a highly talented athlete struggle like how RG3 is currently. But it’s even harder to be in the leadership role and faced with difficult decisions. Next time you find yourself in a challenging conundrum ask yourself what would you think about each choice a year from now. Almost always, the one you will think higher of a year down the road is the choice you need to make today. Better take time to think about the future now rather than mentally replaying the past and wishing you made a different decision.